I love to find ideas and information that will help you envision what your dream wedding will look like, PLUS give you ideas for doing so on a limited budget, so I’m constantly on the lookout for great ideas, articles, and resources. Below are some I found this week, plus a few of the best deals from our partners. Designer Wedding Shoe Trends 2012. Wedding shoes are much different than only a few years ago. You can still choose traditional white satin, of course, but the range of choices has grown considerably. Colors, as well as interesting texture and other detailing, have been added to the mix. Read more of the top seven designer styles here, on CWebNews. As you are looking, remember you do not have to buy designer shoes to incorporate these trends into your wedding. One option is to decorate plain shoes yourself (The Offbeat Bride has several DIY shoe decorating tutorials here). Another is to buy less expensive shoes with features you love, on sale and/or with a coupon. 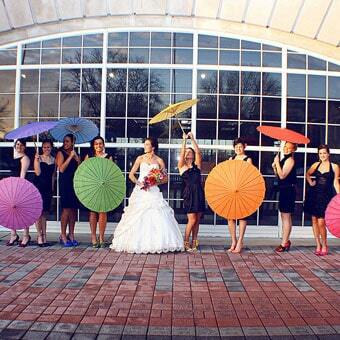 The top ten color combinations for 2012-2013 weddings from DIYweddingplanner Patti, here. The first is red (which I’ve seen a lot of, but have also seen many comments from brides who would never consider a color; it’s white or ivory only for them). Another trend is “rainbow” accent colors (Photo credit: Ashlee Layne, http://www.ashleelaynephotography.com/). What would some of your choices be for the remaining eight? Making a statement at your guest tables is in the details. Cuisine Unlimited in Utah gives us numerous tips–many inexpensive–for jaw dropping table settings and decor. They pack a lot of decorating ideas into the short clip here, on the ABC4 website. 10% back in Super Points through 5/20/2012 at Buy. com. Little known fact: they sell jewelry! (Note: when you get there, click the “get 10% back…” banner.) For more savings, check to see if there are relevant coupons on the Buy.com offers page before you checkout. 40% off full price items site-wide through Sunday, May 20th at The Limited. Use code SAVE40 at checkout. Some of their summery dresses are nice for a casual wedding. Note: You can also check for current sales at The Limited here. Giveaways beginning May 21 at Sephora. They are giving away exotic vacations, once-in-a-lifetime experiences, coveted designer goods, and more. Plus, each day they are giving away a free deluxe gift with every order over $25. Combine it with a sale and you can save nicely. Sephora sales and offers are here (while you are there, look for the deep discounts on Color of the Year collections).